NEW ORLEANS (AP) — A weakened Tropical Storm Harvey pushed through Louisiana on Wednesday, still posing a continued statewide threat of heavy rain and flash floods and spawning at least one tornado in Mississippi as it headed northeast after an early morning landfall. Gov. John Bel Edwards acknowledged a diminishing threat from the storm in southwest Louisiana, but urged state residents to stay vigilant as Harvey headed northeast on a track that would take it out of state late Thursday as it weakens to a depression. At an afternoon news conference, Edwards said 330 people were staying at a Lake Charles shelter as of Wednesday afternoon. He expected that number to grow as more people are rescued from floodwaters in eastern Texas, just over the state line. He said a Shreveport shelter would be available for 3,400 Texas flood victims if officials accept Louisiana’s offer. “That’s what it means to be a good neighbor,” Edwards said. Edwards was heading to south Louisiana Wednesday afternoon. His office said he was going to the Texas state line, where the Louisiana National Guard was assisting with rescues in Port Arthur, Texas. And he was to visit a shelter at the Calcasieu Parish Civic Center. He also sent a letter to the Federal Emergency Management Agency seeking to add seven parishes to the five already placed under an emergency disaster declaration by President Donald Trump. Rescues from flooded homes were reported late Tuesday and early Wednesday in rural Calcasieu Parish in southwest Louisiana, a region hit hard as Harvey pummeled Texas. But winds were down Wednesday morning, amid light rain. 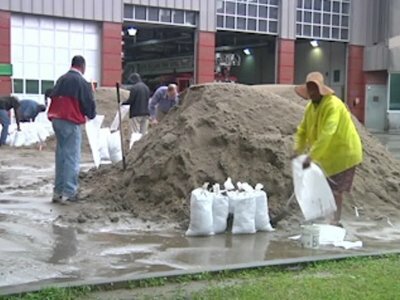 “We got an amazing amount of rain but not the kind of disastrous, catastrophic things that have happened just 25 miles way,” said Tom Hoefer, a spokesman for Calcasieu’s emergency office. On the Louisiana coast at the Texas state line, officials in Cameron Parish lifted an evacuation order Wednesday and reported that roads were passable. In New Orleans, traffic and business activity picked up as schools and government buildings re-opened and sunshine frequently broke through the clouds. The facilities had been closed Tuesday amid fears that Harvey might bring more flooding rains just weeks after an early August downpour triggered flash floods and exposed problems with the city’s drainage pumping system. Jim Buras, who made major repairs to his home after Hurricane Katrina in 2005, and saw minor flooding early this month, was relieved but still anxious. “I was having nightmares of having to do it again,” he said. Severe weather threats lingered, however. Every corner of Louisiana was under some type of Harvey-related weather advisory Wednesday afternoon. Eastern parishes, from north of Baton Rouge, along the Mississippi state line to the Arkansas border, were under a tornado watch until early evening. Coastal surge warnings remained in effect and the entire state was under flash flood watches or warnings. Harvey spawned at least one tornado in Mississippi, and created bands of strong winds that damaged homes and toppled some trees. The National Weather Service says the tornado touched down Wednesday in the southern Mississippi town of Petal, near Hattiesburg. No injuries were immediately reported. Radar showed bands of rain still swirling into Louisiana — the heaviest along the western edge — as Harvey tracked inland. Harvey’s center was about 50 miles (80 kilometers) southwest of the central Louisiana city of Alexandria later in the afternoon. The storm came ashore before dawn just west of Cameron, Louisiana, bringing maximum sustained winds near 45 mph (72 kph), the U.S. National Hurricane Center said. Harvey had lingered over Texas for days before meandering back into the Gulf of Mexico. Forecasters said Harvey carries a risk of tornadoes across a large part of the South. Hundreds of people were rescued from floodwaters in southwest Louisiana earlier this week, officials said. Meteorologist Roger Erickson warned that some coastal rivers won’t be able to drain effectively because Harvey’s winds pushed in storm surge, aggravating flooding in areas already drenched by more than 20 inches (51 centimeters) of rain. State offices in 28 parishes and most Baton Rouge area schools remained closed Wednesday in anticipation of possible severe weather. Harvey’s devastating flooding brought back tough memories in New Orleans on Tuesday, the 12th anniversary of Hurricane Katrina. Mayor Mitch Landrieu opened his Tuesday news conference with a moment of silence for Katrina victims and words of support for Harvey’s victims in Texas and southwest Louisiana. No Harvey-related deaths were immediately reported in Louisiana, according to a spokesman for Edwards. Kunzelman reported from Baton Rouge, Louisiana. Associated Press reporters Stacey Plaisance, Kevin McGill and Janet McConnaughey in New Orleans, Johnny Clark in Lake Charles and Jeff Martin in Atlanta contributed to this report.